Ekta works in Koraput, Rayagada, Khurda and Balangir districts of Odisha State in India. Odisha is set on the east coast on the Bay of Bengal and is one of the poorest States of the country having low in developmental indicators. Koaput and Rayagada district is located in the southernmost end of the State along the mountain range of the Eastern Ghats. These districts are one of the poorest districts of Odisha and have a high Scheduled Tribe and Scheduled Caste population. 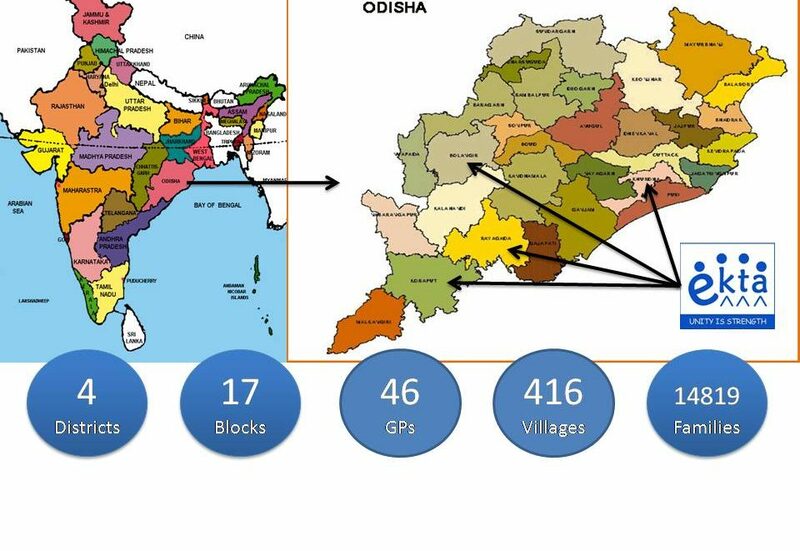 At present, Ekta is working in 28 Gram Panchayats of Koraput, Jeypore, Borigumma, Kotpad, Dasmantpur, Laxmipur, Semiliguda, Pottangi and Boipariguda blocks in Koraput district and 15 Gram Panchayats of Balangir, Patnagarh, Khoprakhal and Belpada blocks in Balangir district. It has its presence in Koraput Municipality and Sunabeda NAC with various interventions. In Rayagada district we are working in 3 Gram Panchayats of Rayagada block. Ekta also works in a further 8 blocks of Koraput district through its networks & alliance partners. Recently we have intervened in Khurda district with the support from Handicap International for addressing disability activities and policy advocacy.